Gibson Jama Sibanda was born in Filabusi in 1944, a year before the momentous strike on the Railways in what was then Southern and Northern Rhodesia in 1945, a sector in which Sibanda would learn and develop the trade unions skills that would serve him so well in later years. He attended Mzinyathini Primary in Esigodini district, and Tegwane Secondary, where he attained his ‘O’ level certificate. In later years he advanced his educational level through the attainment of a Diploma from the J.F.Kennedy School of Government, at Harvard University. In 1969 Gibson Sibanda married Ntombizodwa in 1969, and they raised four children, Sibongile, Thandiwe, Mbuso and Zanele. His beloved Zodwa, who passed away in 2003, was a political and human rights activist in her own right. Between 1965 and 1982 he worked at different times as a fitter and train driver on the Rhodesia Railways and National Railways of Zimbabwe respectively. During the UDI period he also became involved in nationalist politics serving as the Secretary of Welfare for the Zimbabwe African Peoples Union (ZAPU), during his period of detention at Wha Wha and Marondera detention camps. While in detention Sibanda, like many other nationalist leaders, furthered his education by completing his ‘A’ levels. In the post-colonial era Sibanda played a key role in reorganising the labour movement in the country, at a time when the Zimbabwe Congress of Trade Unions, formed from five trade union federations, was until the mid 1980’s a wing of the ruling party. Between 1982 and 1988 Sibanda became President of the Railways Association of Enginemen and President of the Amalgamated Railways Union, thus playing a key role in the deracialisation and unification of the railway unions. More significantly Sibanda rose to the position of Vice President of the Zimbabwe Congress of Trade Unions in 1988, becoming the President of the labour federation in 1989. In the decade that Sibanda held this position, he developed a close and very effective relationship with the charismatic General Secretary of the ZCTU during this period, Morgan Tsvangirai. Under their leadership the trade union movement was transformed from a weak and unaccountable organisation under the patronage of Zanu PF, into one of the most effective labour federations on the African continent. Through the reorganisation of the ZCTU’s organisational, legal and educational departments, the labour federation contributed to the shopfloor growth of sectoral unions. 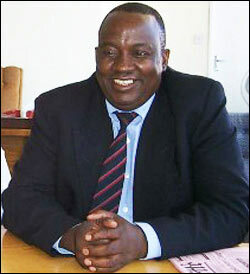 Additionally along with other leaders in the ZCTU, Sibanda expanded his linkages with the international trade union movement through his involvement in structures such as the International Labour Organisation, the International Confederation of Trade Unions, and the Commonwealth Trade Union Congress. For those who were close observers of the labour movement during this period it was clear that the partnership of Tsavngirai and Sibanda combined the leadership flair and exhuberant style of the former, with the more quietly anchoring and unifying role of the latter. This combination, the most effective and exciting in Zimbabwe’s labour history, galvanised not only workers into action, but developed a broader language of democratisation that built a multi-organisational alliance with other groupings in the country. This alliance sent a clear signal to Zanu PF that its descent into authoritarian politics would not go unchallenged. In the face of constant elitist provocations by the Zanu PF leadership about the educational levels of the labour leadership, this ‘little train driver’, as Sibanda was derided by a Zanu PF leader, played a key role in transforming the labour movement into the scourge of the ruling party. When the Movement for Democratic Change was formed in 1999, Sibanda’s election to the Vice Presidential position relocated the partnership and friendship with Tsvangirai to the political arena. Under this leadership the MDC, continuing the momentous achievements of the ZCTU during the 1990’s, launched a party that transformed the political landscape in Zimbabwe. In the face of continuous state repression and the petty denigration of the Zanu elite, Gibson Sibanda played a key role in guiding the new party through its early stages and putting in place the party structures required to contest for state power. In the parliamentary election of 2000 Sibanda was elected as the MP to Nkulumane, defeating the formidable figure of Dumiso Dabengwa. As in the ZCTU, Sibanda played the quiet role of anchor and unifier in the MDC, helping to iron out some of the early organisational and political problems in the party. In line with the general harassment of the leadership of the MDC, Sibanda was charged with inciting violence at a rally at White City Stadium in 2001 under the Law and Order Maintenance Act, one of the many vestiges of colonial repression deployed by the new state after 1980. The charge was dropped in January 2003, only for Sibanda to be arrested again in April 2003, accused under POSA of seeking to overthrow the Government through the mass action of 18-19 March. He was held in custody for seven days before the charges were finally withdrawn in early 2004. In 2005 when the MDC split over issues of organisational accountability and strategy, Gibson Sibanda was devastated not only by the split, but by the bitter and vitriolic character that marked the fracture. Along with the death of his wife in 2003, it was this split and the damaging effect it had on his long time friendship and working relationship with Morgan Tsvangirai, that had such a devastating effect on him. Tsvangirai himself felt this damage to their friendship acutely. Sibanda had no doubt that the split was one of the biggest blows inflicted on the emerging democratic movement, and it is difficult to contest that judgement. From 2006, Sibanda served as the Vice President of the smaller formation of the MDC under the leadership of Arthur Mutambara, a role he took on with no illusions about the enormous difficulties this formation faced, but in the belief that there was little choice but to take this road. In the 2008 election he lost his parliamentary seat as did many of the leaders of this formation, and was faced with a forlorn political future, until the signing of the GPA in 2008 and the formation of the Inclusive Government in 2009. In the new arrangement Sibanda was elected to the Senate, and appointed the Mutambara nominee to the new Organ of National Healing. Given his own lifelong commitment as a unifier and healer it is a great tragedy that these challenges remained so obviously unmet during his lifetime. The passing of the humble and avuncular figure of Gibson Sibanda on the 24th August 2010, is a great loss to his family, both MDCs, the broader democratic movement, and the country. His personal history along with others, defies the narrow selective definition of ‘national hero’ that has become such a contested feature of Zimbabwean politics, and contributes to the growing debate for a more inclusive history of the nation, that will take Zimbabweans beyond the exclusivist notions of national belonging that have marred the post-colonial state. very sad. i had known him for 10 years.